Weekend event at the Oregon Museum of Science and Industry draws 120 exhibitors from around the region. The Future Bus is a familiar sight at Beaverton schools, having made about 150 stops during its two years in existence. But it found a wider audience last weekend at the seventh annual Portland Mini Maker Faire at the Oregon Museum of Science and Industry, which drew more than 120 exhibitors. Melody Beaird, OMSI's interim events manager, says it is a showcase for the region's talent. The bus itself is almost 30 years old. But for Doug Bundy, a teacher who is part of the technological innovation team for the Beaverton School District, it's what's inside that counts. The bus has 3-D printers and other electronic gadgets — the exact mix changes depending on the event — but the concept behind the bus is to give students new ways of expressing themselves and creating things. Bundy is a former music teacher at Aloha High School, and before his current stint, he taught technology arts at Raleigh Hills Elementary School. The team of teachers is led by John Peplinski, who was the principal at Raleigh Hills before becoming district administrator for instructional innovation. Bundy said it is one thing to teach about the scientific principles of sound and electricity — and another to connect them with creative activity. But technology comes from two Greek words, the first of which is "techne," defined as "art, skill, craft, or the way, manner, or means by which a thing is gained." "We tend not to associate technology with creativity — but it's always been associated with creativity," Bundy said. "My move from music (into technology) was about how we can continue to cultivate creativity." 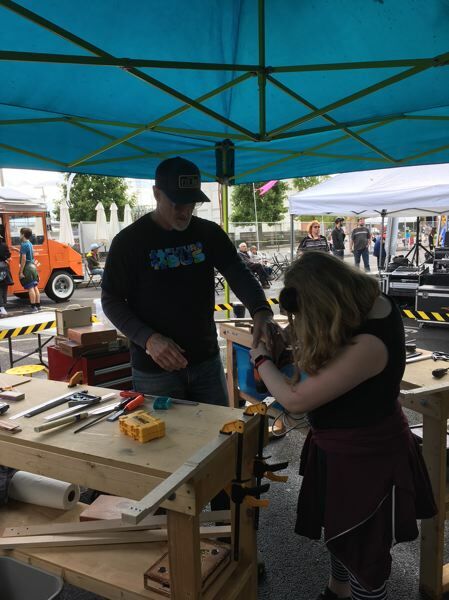 At the Mini Maker Faire, three stations inside the bus allowed students to experiment with pitch, frequency and amplitude to create their own sounds. Or they could test their cigar-box guitars, which they could build in 17 steps at an outside station. "What is great about an arts lens is that you get kids creating and expressing — and they get connected emotionally to the material — instead of talking first about the concepts of sound and electricity," Bundy said. "We get it reversed sometimes in education — that you have to know everything about it before you do something cool with it. It doesn't always work. But when you get kids creating something cool that they care about, they are going to want to know more about those concepts." Bundy said he subscribes to the notion promoted by U.S. Rep. Suzanne Bonamici, also from Beaverton, that programs promoting science, technology, engineering and math (STEM) should add an "a" for arts (STEAM). 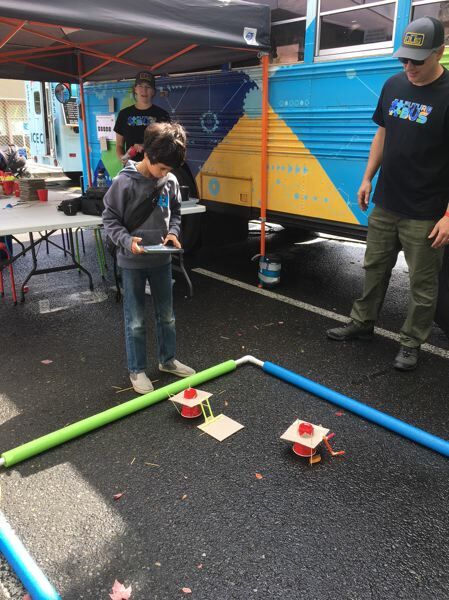 Another outside station at the Future Bus enabled students to design their own devices for a robotics competition named after the TV series "BattleBots." Another inside station played a video of the work at Terra Nova School of Science and Sustainability, which reopened in 2014. 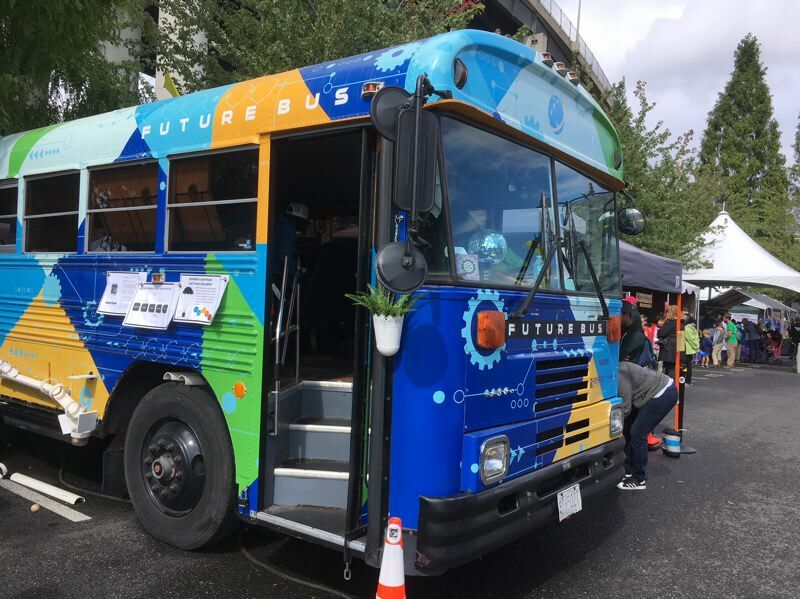 The Future Bus came about as the result of a TEDx Portland talk in 2015, when Bundy and others described how school could be reimagined to fit the changing times. Bundy said First Tech Federal Credit Union approached him afterward. "They liked our vision of what education could look like, and they wanted to help," he said. "We threw the idea of a maker bus out there. We thought it would be great to have something in our own district that would serve our needs and be deployed to support our efforts in our schools." He said activities on the bus, outside the bus and those "push-in" to classrooms give students the feeling of being on a field trip without ever leaving campus. He said the bus is equipped with something else — a coffeemaker for the teachers. "When you get teachers on the bus to sit down and have a cup of coffee, you start to get the kinds of conversations you do not get when you just go into classrooms and try to introduce teachers to new ideas," Bundy said. "It's a different environment." As demonstrated by the station for cigar-box guitars, the Future Bus isn't focused solely on high-tech. "We have done a great job of encouraging kids to go to college and be ready," Bundy said. "But our team and our district want to return to a place where it's also awesome if you want to work with your hands. We are teaching science and math, but we are also getting tools in kids' hands.